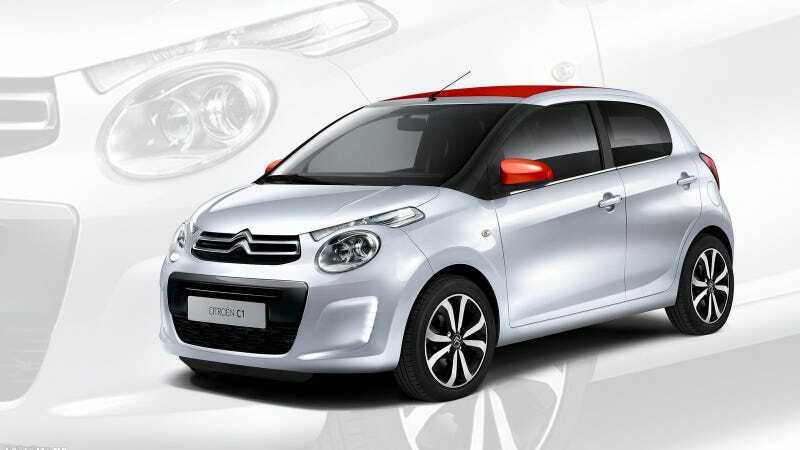 With little eyebrows over the headlights and a kinda shouting mouth, the 2015 Citroën C1 has got to be the ugliest little turd on the market, maybe anywhere in the world. But dammit, it's a cheap, light little French hatchback so I can't help but like it. Let's take a look at those headlights head on, thanks to this demo ad. The car shares its platform with the rather handsome Peugeot 108 and the as-yet unrevealed Toyota Aygo. Citroën claims a weight gain of 35 kilos over the old model. That makes this 2015 model 840kg, or 1,851 pounds in Americaland where this car will not be sold because the gubment dudn't think it's safe fer the air or fer crashin'. Also because next to nobody wants to buy an 11-foot-long, 82bhp econobox over here. Look forward to seeing these things on your next French exchange trip (with 9/10 body panels dented) and nowhere else.